The BODYGUARD® Pillow Plus comes with innovative visco foam technology for effective pressure relief. Its ergonomically shaped support core adapts perfectly to any position and ensures a relaxed sleep. Maximum flexibility when selecting the reclining height allows the pillow to adapt to individual needs. Thanks to its 3D spacer fabric, the advanced HyBreeze® Cover offers outstanding moisture management. The BODYGUARD® Pillow Plus reliably relieves the sensitive neck and shoulder area. The memory effect ensures an individual adaptation to the body and thus effectively supports the cervical spine and neck muscles in every sleep phase and in every position. The pillow makes the ideal addition to the resting comfort of the BODYGUARD® Anti-Cartel-Mattress. Simple and fast purchase procedure without inter­mediaries – all products are available directly through our online store. 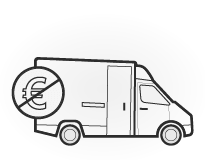 Save time, money and your nerves – just have your order delivered to your door, within Germany free of charge. Test the product in your home for 14 days with money-back guarantee. The BODYGUARD® Pillow Plus is constructed according to the latest ergonomic research and optimally supports your head. Adjust the height of approxi­mately 13 cm with a zipper on the short side of the pillow until it feels right. Simply reach inside the pillow to remove a desired amount of foam flakes and change the height of the BODYGUARD® Pillow Plus. Increase your sleeping comfort and tailor your pillow to your individual needs. The foam flakes can be stored in the enclosed bag to allow the height to be changed again later. The BODYGUARD® Pillow Plus consists of innovative viscoelastic foam. The visco foam technology ensures effective pressure relief in the sensitive neck and shoulder area. Due to the memory effect, the anatomically shaped core of foam flakes adapts individually to your head and neck shape. Whatever position you sleep in: Your head is optimally supported on the BODYGUARD® Pillow Plus. The pillow is covered with the particularly breathable HyBreeze® Cover, consisting of a techno­logically advanced 3D spacer fabric for the best sleeping conditions. The breathable HyBreeze® Cover allows optimal wicking of body moisture and ensures a comfortable sleeping environment. The material is the same as that used for the cover of the BODYGUARD® Mattress, which was rated “very good” (“test” 10/2018) by Stiftung Warentest. The highly elastic 3D spacer fabric supports the effect of the viscoelastic foam core by flexibly following its every movement. Thus the head and neck are superbly supported at every twist and turn. The removable HyBreeze® Cover can be easily opened at the zipper and removed from the cushion. This allows it to be washed separately in any house­hold washing machine. The washability of the high-quality cover at 60 °C allows for flawless hygiene. The innovative material of the HyBreeze® Cover quickly air-dries and so can be placed back on the pillow after a short time. If you want to achieve optimal performance, you need good partners you can rely on. This also holds true for the BODYGUARD® series: our Pillow Plus and Slatted Frame work best when they are teamed up with the best mattress ever tested – the BODYGUARD® Anti-Cartel-Mattress.